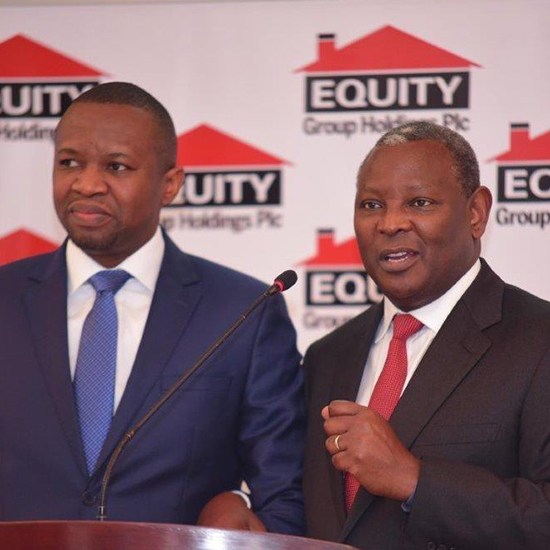 Equity Group’s pursuit of a unique business model and strategy to create resilience and manage headwinds of interest rate capping and challenging macroeconomic and business environment has delivered differentiated 2018 financial and business results. The group released their annual financial results on 26 March 2019, where they grew profits to 28.5 billion, a profit growth of 6% and a 13% growth in customer deposits. The liability franchise has been strengthened with the customer base growing to 13.5 million clients and customer deposits growing at 13% to reach Kshs.422.8 billion up from Kshs.373.1 billion driving the growth of the balance sheet to reach Kshs.573.4 billion up from Kshs.524.5 billion the previous year. “This is the growth resilience we were pursuing to navigate the headwinds of slow growth rate of the private sector credit”, said Dr. James Mwangi the Group Chief Executive and MD. The loan book grew by 6% to reach Kshs.297.2 billion, while maintaining a non-performing loan ratio of 7.6% against a Kenya banking sector NPL ratio of 12%. The Group fortified the asset base by maintaining the cost of risk at 1.2% by increasing loan loss provision by 8% up to Kshs.3.7 billion, thus boosting the NPL coverage to 89% up from 69%. “This is the prudence that was dictated by the difficult operating environment”, said Dr. Mwangi. Despite pursuing a conservative strategy, the Group registered a 6% growth in Profit Before Tax. Profits grew to Kshs.28.5 billion up from Kshs.26.9 billion. With Profit After Tax growing to Kshs.19.8 billion up from Kshs.18.9 billion the previous year. Whilst the Group has fortified the balance sheet, it has also created latent value with a high liquidity ratio of 54% providing capacity for higher margin growth. The profit growth was underpinned by a 10% growth in net interest income, driven by a 6% growth in loan book and 26% growth in investments in Government securities. Cost optimization during the year resulted into a 1% growth in total costs to Kshs.38.8 billion against a total income growth rate of 3% to Kshs.67.3billion. Efficiency gains from operations saw cost income ratio reduce from 53.5% to 52.2%. Effective intermediation-maintained yield on interest earning assets at 11.2% against a cost of funds of 2.7% while registering 1% growth in total costs due to successful digitization. The net positive effect of efficiency gains was a return on average equity of 21.1% and a return on average assets of 3.6%. With the strong cashflow, the Board of Directors have recommended a pay-out of 38.3% of profits available for distribution, a dividend of Kshs.7.5 billion resulting in a pay-out of Kshs. 2 per share or 400% on par and a dividend yield of 5.7%.